World of Warcraft (WoW) is a massive multiplayer online role-playing game (MMORPG). This game is the most played game of its type, and this is mainly due to its great development and its two expansions, and the world on which it's based. Once in this fantasy world, we will have to create a player character, from The Alliance or The Horde, with whom we will have to complete missions and quests, so we can improve our abilities and increase our level. To go up in level and obtain booty, you'll have to complete different missions and visit all the dungeons in the game, that will be more and more difficult as you go up in level, so some help could come in handy. WOW QuestHelper Addon does exactly that. 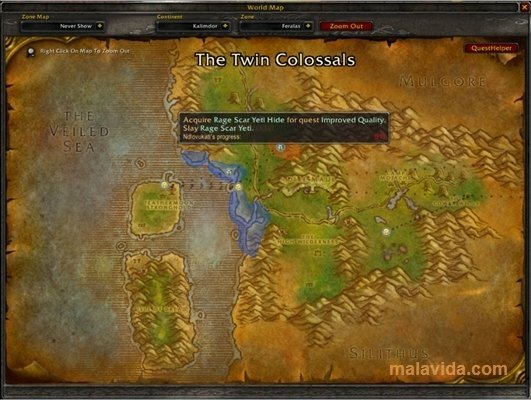 This add-on only has to be downloaded, extracted and copied to our World of Warcraft add-on folder, once this is done, we'll have a renewed mission menu and improved maps, that will offer us clues as how to complete each mission, recommending weapons and equipment, and showing us the fastest path to finish each quest. 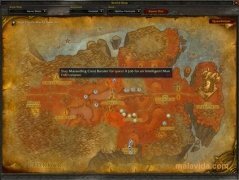 If you need some help to accomplish the quests from World of Warcraft, don't think twice, and download WOW QuestHelper Addon right now.